A WATER tragedy does not have to be the precursor of action to improve water management. The water shortage in the summer of 1993 gave a taste of such a tragedy to the residents of Amman; contamination of western Amman's water supply in 1998 provided another glimpse into what life could be with a miserly supply of water. To provide alternative water sources to the agricultural and domestic sectors, as well as to improve the situation on the eastern bank of the Dead Sea, the Water and Irrigation Ministry initiated a plan, comprising 61 projects, for the period 1998-2010, at an estimated cost of JD3.5 billion. Most significant are capitalising on the Disi basin groundwater, building dams in the southern region, improving Khirbet Al Samra wastewater treatment plant and desalination. 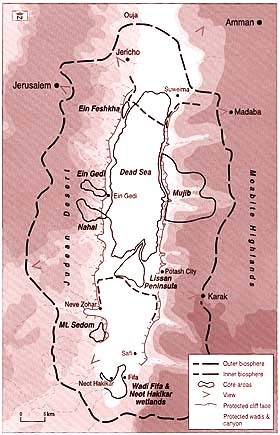 As far as the Dead Sea is concerned, the Red-Dead canal is being advocated once again, a proposal whose supporters claim will restore the lake's pre-1960s water surface area, two-thirds of which currently exist, within around 20 years. The canal, now called “peace conduit”, would infuse Red Sea water into the Dead Sea. It appears like a perfect solution to a worrying problem, making up for the dwindling contribution of the Jordan River. Transforming the proposed canal into a conduit, according to the secretary general of the Jordan Valley Authority (JVA), was meant to minimise costs, reduce environmental impact and hasten conclusion. A canal is cut through land, much like the Suez Canal, producing an artificial river and consequently increasing shoreline area. A conduit is actually only a pipe. “Transporting a large body of salt water over freshwater aquifers could threaten contamination,” said Abdel Rahman Sultan of the Friends of the Earth Middle East (FoEME), who is performing a small-scale environmental impact assessment (EIA) of the consequences of the project. Withdrawing large volumes of water from the Gulf of Aqaba is bound to upset its natural aquatic equilibrium. Transporting the salty water over freshwater basins in southern and northern Araba could be a recipe for disaster, and pouring ten times less saline, full of aquatic life, water into the Dead Sea could have “interesting” results. “A simple model to represent the changing conditions can be created, using appropriate software, but reality is more complex; you can never tell 100 per cent what the outcome will be,” said Sultan. He added that hardly any data is available at present, and called for the creation of a baseline information database to minimise the unexpected. “If there are serious potential negative outcomes, we will use scientific evidence to back up lobbying for action that would minimise the environmental damage,” added Sultan. Possible effects at the Aqaba end are on the sea larvae, which are at the bottom of the aquatic food chain; their physical removal is the most probable. Also, mixing different temperature water layers is likely to occur, modifying the environment inhabited by an array of diverse sea life. “Pouring less-saline Red Sea water into the Dead Sea will produce a lateral and vertical concentration gradient at the input zone due to the water density difference. This can even result in aquatic life,” said Sultan. Studies indicate the presence of algae and several species of aerobic and anaerobic bacteria in the Dead Sea. Heavy rains in 1980 and in 1992 led to the lake's dilution, resulting in the flourishing of some bacteria that turned the surface colour to reddish blue. Some scientists predict that a sudden inflow of relatively freshwater could turn the sea green at first and then bright pink. The 400-metre vertical drop between the two seas could be harnessed to generate electricity. According to a United Nations University report, the theoretical hydro-potential, exploiting the head difference off 400 m by diverting 56.7 cubic metres per second (1,600 million cubic metres per year), is estimated at 194 MW. A hydro power plant would produce 1.3 billion kWh per year of electricity with an installed capacity of 495 MW, assuming peak-power operation. These figures belong to a study of an Israeli plan for connecting the Mediterranean Sea with the Dead Sea, but the theoretical calculations are generally applicable. Jordan's total annual electrical energy requirement is 6.453 billion kWh; thus, the vertical drop can theoretically generate up to roughly one-fifth of the country's electrical power requirement. A study started in the early 1980s by Harza Engineering from Chicago suggested that the (then) canal could generate freshwater. The water pressure would be enough to push sea-water through an artificial membrane that would separate the water from its dissolved substances — reverse osmosis (RO) desalination. Other studies suggest that the drop is not enough and that further pumping is required; either way, there is potential for freshwater. Most Gulf countries satisfy almost all their freshwater demand through desalination due to their presently abundant petroleum supplies. With improved technologies in the field, conversion rates of up to 70 per cent have been attained by RO methods, according to Fransesco Civili, member of the Mediterranean Action Plan (MAP) coordinating unit. With a conduit flow rate of 1,600 mcm per year, over 1,000 mcm of freshwater can be produced by RO desalination. However, during the desalination process, a number of chemicals are added, such as disinfectants, anticorrosion and antifoaming additives that may be discharged along with the concentrate (outflowing water that was not desalinated). This has the potential to damage the environment, according to Civili. With untreated sewage flowing into the Dead Sea expected to increase up to about 35-50 mcm per year, proper management of materials entering the lake is vital. According to Thafer Alem, secretary general of the Jordan Valley Authority (JVA), the outflowing concentrate could also generate electricity. According to Sultan, figures for conduit construction and desalination stand at $0.8 billion and $3 billion respectively, while an EIA could amount to tens of millions. Can the country handle such sums? Grants seem to be the only option, but, according to a report on financing such a project by the American University, Washington, “the World Bank does not finance international water projects unless all riparian states agree to proceed”. Water, considered by some to become the reason for future wars, could also become a source of harmony in the region. If desalination is considered, relatively cheap freshwater, estimated at $0.5/cubic metre, could be supplied to the nation. Currently, 1 cubic metre of freshwater costs the government $1.15, according to Alem. Industry on the lake's shores is consuming about a third of the removed water, with the remainder lost to evaporation. The local Arab Potash Company (APC), which produces around 13 per cent of the world's potash, reported net profits of JD39.5 million in 2001, almost 1 per cent of the gross domestic product. The government has given it exclusive rights to exploit the Dead Sea's minerals on a commercial basis until 2058, with no set limits to the volume of water being used. Extraction of minerals from the Dead Sea is necessary, but its negative impact has to be reduced. Upgrading the upstream industry can generate more revenue from the same volume of water consumed, and part of the profits can be used to fund water conservation projects in the country. Agriculture is another sector siphoning off a large fraction of the Jordan River, Dead Sea's main water input. A third of the 756,300 dunums of local irrigated land is watered by open canals, resulting in losses up to 50 per cent due to evaporation and runoff. Alternatively, drip irrigation uses 30-70 per cent less water than traditional methods without affecting production output. Many local crops consume too much water relative to any significant economic returns. Watermelons, bananas, wheat and various fruit trees can be replaced with more water conserving produce such as olives, figs, tomatoes, dates, spinach and beetroot. Besides drip irrigation, using brackish water for some crops could save up to 6 per cent of the freshwater used in agriculture, according to a study conducted by the National Institute for Agricultural Research and Technology Transfer. If this becomes the case, the water saved could go towards 80 per cent of industry's requirements. Population increase normally means increase in water consumption. But not necessarily so. California's Mono Lake residents learnt to “live within limits”, showing how efforts can be exerted by individuals, not only institutions and the state. According to the USAID-funded Water Efficiency and Public Information for Action, the loss of one drop of water per second from a leaky faucet wastes 0.9 cubic metres of water a year. That could be easily prevented through regular maintenance, while installing other gadgets, such as faucet aerators, could reduce faucet water use by up to 60 per cent. According to the State of the Environment in Jordan 2000-2001 report, rainwater collected by an 80 square metre rooftop can amount to about 32 cubic metres per year, supplying almost a fifth of a six-member family's water needs. With people becoming more dependant on underground wells, excessive pumping of underground aquifers has led to lower underground water tables, to the extent that some wells have reached saline waters. Some of the wells, if not overtapped, can recharge, while others are nonrenewable. Unfortunately, illegal activities and mismanagement resulted in pumping rates exceeding safe levels by 225 per cent in the late 1990s, according to the aforementioned report. The Disi basin, which has been receiving much attention recently, is a non-renewable source of underground water, claimed to be able to offer 100 mcm of water per year for around 50 years. Water pumping from the basin and supply to Amman is estimated to cost JD0.5 billion, with annual running costs of about JD13 million. FoEME, a regional non-governmental environmental organisation, is proposing an immediate solution for the management of the Dead Sea's catchment area. It is advocating registering the area with United Nations Educational, Scientific and Cultural Organisation (UNESCO) as a transboundary “man and biosphere reserve” (MBR). There are currently 425 other registered MBRs around in 95 countries, among which is the local Wadi Dana reserve, registered in 1998. Other MBRs include Omayed and Wadi Allaqi in Egypt, Touran in Iran, Arganeraie in Morocco, and Hawaiian Islands, Golden Gate and Rocky Mountains in the US. MBRs are recognised internationally. They are nominated by national governments and remain under sovereign jurisdiction of the states where they are located. Biosphere reserves serve in some ways as “living laboratories” for testing out and demonstrating integrated management of land, water and biodiversity. They are organised into three interrelated zones, known as the core area, the buffer zone and the transition area; only the core area requires legal protection, the rest allowing industry and tourism activities to go on. Transforming the Dead Sea into a biosphere area or at least trying to preserve it for the future generations is a daunting task facing us. History will judge how we carried it out.